Standard door strike with adjustable tab. Replaces most residential interior and exterior strikes. Fits all standard doorways. Includes 1 strike and 2 installation screws. Standard T-strike, used on wood or metal jambs with most grade 2 locksets. Includes 1 strike with (2) #8 x 1" Phillips flat head combination screws. For bit key mortise locks. Adjustable tab for non-handed installation. Best used with older style locks. Includes 1 strike and 1 set of installation screws. 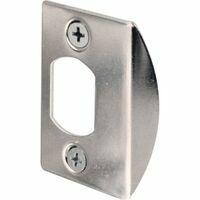 Replaces standard strikes and provides improved security with 3" screws attaching to wall stud. Overall size: 4-1/4"H x 1-1/8"W. Includes 1 strike with (2) #8 Phillips flat head screws and (2) #8 x 3" Phillips drywall screws. Commercial door strike. Fits standard ASA cutout. 4-7/8" x 1-1/4". Includes 1 strike and 1 set of installation screws.